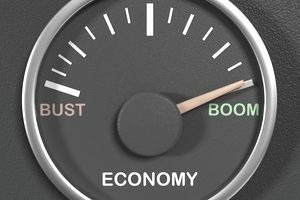 Economic indicators are statistics released by governments, non-profit organizations, and private companies to provide insights into economic health, business cycle stages, and the status of consumers within an economy. These indicators can be broadly classified based on their timing. Leading indicators, like the ISM Manufacturing report, provide an idea of what's to come, while lagging indicators, like the unemployment rate, show what happened in the recent past. In general, investors pay most attention to leading economic indicators, since they can help predict where prices may be headed. Leading economic indicators show potential signs of change before economies show any material changes in their headline lagging indicators. For example, they may provide signs of an upturn or downturn in gross domestic product ("GDP") or other lagging indicators that are important to the market. For instance, initial unemployment claims can be a leading indicator of the unemployment rate, which can have a big impact on equity indexes. Investors use leading economic indicators in order to predict the direction of economies and specific sectors within them. For example, a slowdown in manufacturing output could signal a coming drop in retail sales as retailers stock fewer items. The drop in retail sales could result in lower revenues across the retail sector, as well as a slowdown in a primarily service-based economy, which could prompt investors to sell retailer stocks and other consumer discretionary equities. Leading indicators are also used by central banks in order to make many monetary policy decisions. For instance, a central bank may opt to lower interest rates or implement easing policies if leading indicators suggest that the economy is faltering. The opposite may be true if leading indicators suggest that the economy is strengthening. Investors may respond by selling equities when interest rates are on the rise or buying equities when interest rates start to fall. Using leading indicators is relatively straightforward. Most investors look for changes relative to both the prior reading and economist forecasts or expectations. Failure to meet expectations could signal a bearish trend ahead while surpassing those estimates could signal a bullish move ahead. Signals of a rapidly declining or rising economy could also result in more likely monetary policy action, such as monetary easing to help stimulate the economy. Specific leading indicators can be good and bad for different investments, too. For example, gold may react positively to poor economic data (when it's used as a safe-haven), while payroll stocks may be particularly sensitive to leading indicators that suggest companies aren't hiring as much. The Conference Board, a non-governmental organization ("NGO"), has created a leading economic index in the U.S., called the Conference Board Leading Economic Index. While not directly applicable to international investors, the index does provide some insights into what leading economic indicators may be worth watching the closest. The monthly employment report, which includes the unemployment rate, average hourly earnings, and the average workweek hours. The initial claims for state unemployment insurance. The monthly consumer goods and materials report, which includes manufacturer shipments, inventories, and orders. The monthly non-defense capital goods report, which includes manufacturer shipments, inventories, and orders. The monthly report on building permits, including housing starts and building permits. The spread between 10-year Treasury Bill interest rates and the federal funds rate. The central bank's inflation-adjusted measure of the M2 money supply. The ISM manufacturing index, which includes supplier deliveries, imports, production, inventories, new orders, new export orders, order backlogs, prices, and employment. The University of Michigan Consumer Sentiment Index of consumer expectations. International investors can find these same types of aggregate leading economic indicators in many other countries around the world. Alternatively, they may compile the information on their own using a series of economic indicators that are available to them. Economic indicators are broadly classified based on their timing, ranging from leading indicators to lagging indicators. Leading economic indicators are those that change before economies show any signs of change. Leading indicators are used by investors to help predict the direction of economies and important lagging indicators for use in making investment decisions.